This post was last updated August 20, 2018. 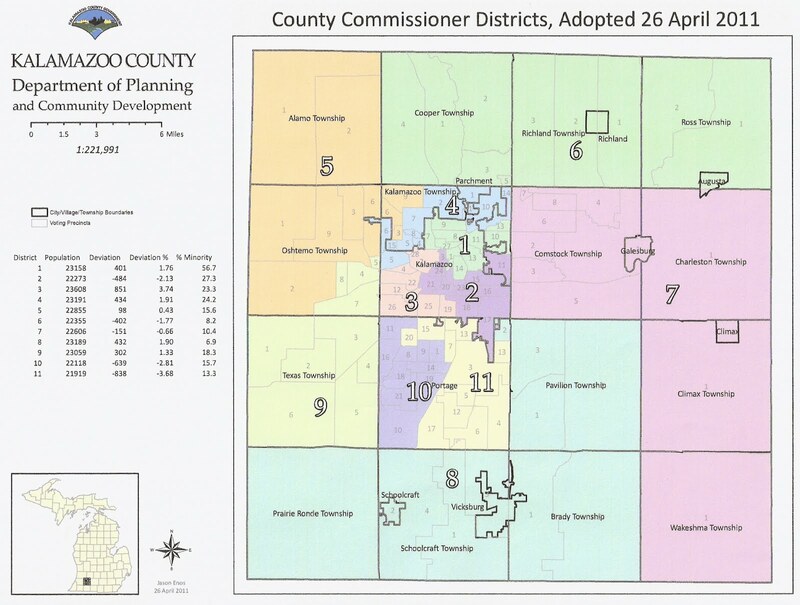 Democrats won a 6-5 majorities on the Kalamazoo County Commission in 2014 and 2016, which were generally good years for Republicans. There were three open seats on 2016, and there is one (district 2) this year. The following post has detailed descriptions of the districts and their political leanings. The numbers given are the percentage the Republican county commission candidate got in 2012, 2014 and 2016, and Ruth Johnson's (2010), Mitt Romney (2012) and Donald Trump (2016) percentages. Incumbents are marked below with asterisks. Stephanie Moore replaced Carolyn Alford in 2014 in this majority minority district. Moore was a Kalamazoo city commissioner and has been convicted of several crimes over the years. She allied with Republicans to make Dale Shugars the board chairman for one year and became chair for 2018 herself. Incumbent Kevin Wordelman, a union organizer at WMU, won this seat vacated by David Buskirk in 2014. He is retiring this year. Hall was elected in 2016, replacing John Taylor. Hall was previously a candidate for Kalamazoo city commission in 2013. Coss is running again after losing in 2016. Seals defeated fellow democrat commissioner (02-10) Franklin Thompson in 2010. This year, he barely survived a primary challenge from Shequita Lewis, who was backed by Stephanie Moore. Rogers won this competiive seat in 2012. Dillon, a staffer for Congressman Fred Upton, is running again. Kendall, a staffer for state rep. Tom Barrett (14-P) of Eaton County, succeeded Jeff Heppler in 2016. He beat Vince Carahaly, a moderate businessman, and Frank Brooks, a passionate Trump supporter, 39-35-26 in the primary. Tuinier, who is a greenhouse owner, barely defeated Leroy Crabtree in 2012. He beat David Burgess, a Comstock Township Trustee, in 2014, and Pat Clark, a Climax Village Trustee, in 2016. 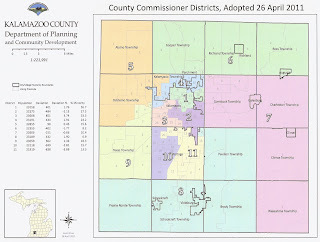 Commissioner John Gisler was elected in 2010 but deferred to fellow commissioner (02-12) David Maturen in the 2012 Republican primary due to redistricting. Gisler returned in 2014 when Maturen was elected to the state house. Gisler defeated Kraig Lee, a union democrat in disguise, in the primary this year. Shugars, a conservative former state senator (94-02) and state rep (90-94), was elected to the commission in 2014, succeeding Brandt Iden. He was board chairman in 2017 thanks to a deal with democrat Stephanie Moore. Quinn was a commissioner 2008-2010. Following R Phil Stinchcomb (10-12) and D Larry Provancher (95-02, 14-16), Quinn returned. Carra, a staffer for state rep Steven Johnson (16-P) of Allegan County and secretary of the Kalamazoo GOP, defeated Ansari, a county commissioner (02-12) and Portage city commissioner (13-17) who lost a race for mayor of Portage in 2017, in the primary. McGraw succeed John Zull (00-14). McGraw formerly worked for the Kalamazoo Homebuilders Association and is now Chairman of the Kalamazoo GOP. Place is the wife of former commissioner (02-16) and democrat party chairman John Taylor.